Project obstacles and solutions: This lake house was built in a heavily wooded area. The owner wanted a variety of architectural concrete surrounding the property that would complement both the color and texture of the buildings on the property. Steve Harriman of Harriman's Bomanite used imix Spectra Yosemite Sand as a base for the color in the concrete. Since imix Spectra color is mixed integrally in the concrete, it pervades the entire depth of the poured slab. Harriman used a sweat finish for the driveways and sidewalks that used a stone texture border. The border was colored with a shake on color hardener. 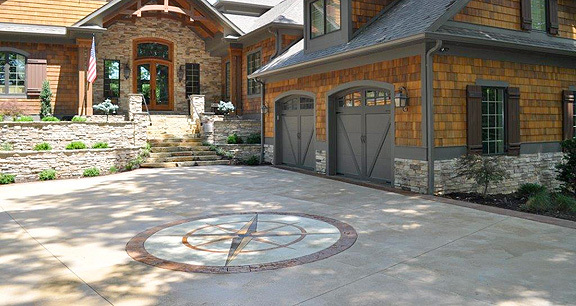 The homeowner also wanted a compass in the center of the driveway. Harriman created this feature with acid stains and a shake on color stamped border. There were multiple levels and steps on the patios overlooking the lake. Harriman again used an imix Spectra Yosemite Sand base with a shake on color release to add depth to the stone textured finish. The stamped border was carried over from the front of the house. The patios were finished with a diamond angled relief joint pattern cut into the concrete. In all, Harriman poured over 90 yards of imix Spectra colored concrete. This project was recognized with a 2013 Excellence in Concrete Award for residential decorative concrete from the IRMCA.